Commissioner and director of School Education Telangana issued a RC. 44 dated: 7-11- 2017 for TS Vidya volunteers modified orders. as per the RC TET is not mandatory for TS Vidya volunteers for Appointment for the academic year 2017-18. TET is not mandatory as qualification for Applying for the post of Vidya Volunteer-2017-18. Due to announcement of TRT DSC 2017 by TSPSC most of the TET qualified candidates working as Vidya Volunteers( VVs ) are not attending to their duties due to preparation for TRT DSC 2016 Teachers Recruitment Test.So Govt issued guidelines to engage vidya volunteers at Primary,Upper primary& Secondary level as per GO.97 Dated: 26-6-2016. Sub:School Education Engaging of Vidya Volunteers during 201 7-1 8 _ Reg. 1.G.O.RI.NO.86. School Education (Prog.|) Dept. dated:25.05.201 7. 2.G.O.No.97, School Education (Progl) Department. dated 29.06.2016 along with guidelines. All the District Educational Officers in the State are informed that. 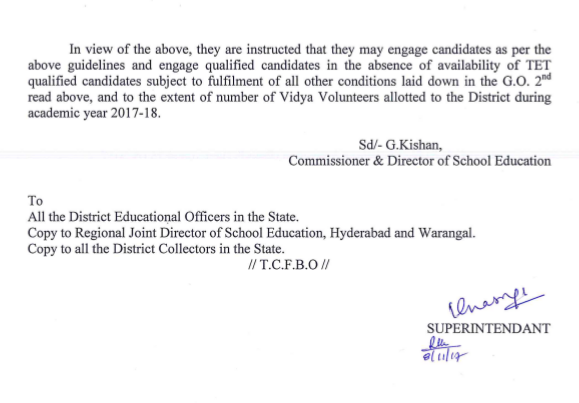 certain Collectors and District Educational Officers brought to the notice of the under signed that due to announcement of Teacher Recruitment Test by the Telangana Public Service Commission, most of the TET qualified candidates working as Vidya Volunteers are not attending to their duties due to preparation for Recruitment Test. 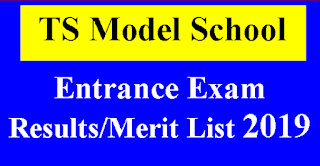 Due to which it has become difficult to engage TET qualified candidates as Vidya Volunteers. They have requested to relax the condition of engaging TET qualified candidates as Vidya Volunteers. 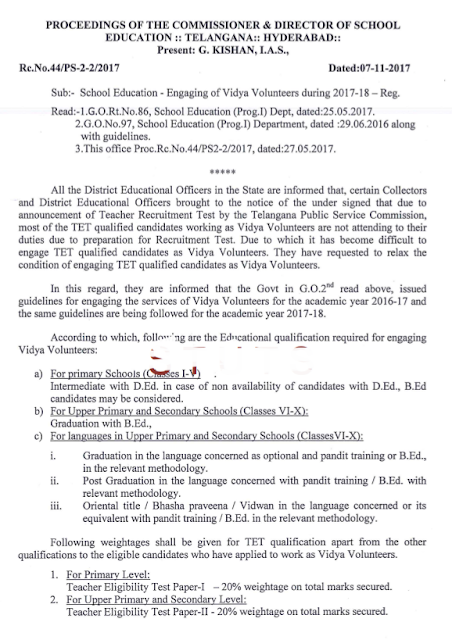 In this regard, they are informed that the Govt in G.O 2nd read above, issued guidelines for engaging the services of Vidya Volunteers for the academic year 2016-17 and the same guidelines are being followed for the academic year 20l7-l8. i. Graduation in the language concerned as optional and pandit training or B.Ed. in the relevant methodology. ii. Post Graduation in the language concerned with pundit training / B.Ed. with relevant methodology. iii. Oriental title /Bhasha praveena / Vidwan in the language concerned or its equivalent with pandit training/ B.Ed. in the relevant methodology. 1. For Primgy Level: Teacher Eligibility Test Paper-1 20% Weightage on total marks secured..
2. For Upper Primary and Secondory Level: Teacher Eligibility Test Paper-ll 20% weightage on total marks secured. ln view of the above, they are instructed that they may engage candidates as per the above guidelines and engage qualified candidates in the absence of availability of TET qualified candidates subject to fulfilment of all other conditions laid down in the G.O. 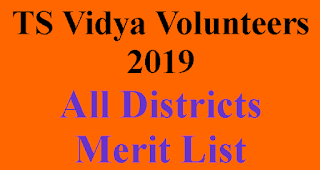 2nd read above, and to the extent of number of Vidya Volunteers allotted to the District during academic year 20l7-18.